What will I be this year? 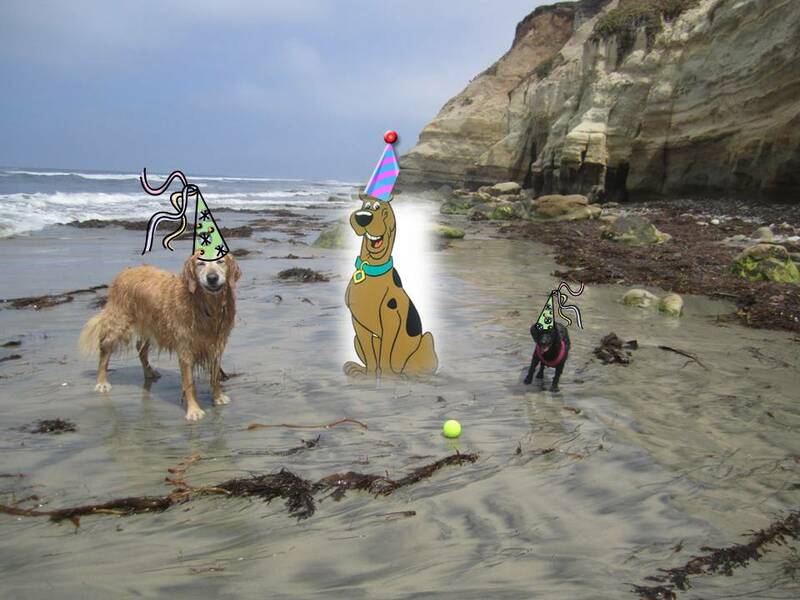 Happy Belated Birthday Scooby Doo! Today is the second day of Rosh Hashanah. the Jewish New Year 5772. It is believed that it is when G*D starts to decide everyone's fate for the next year. So for the next 10 days you can repent to try to get a good outcome. Then it's Yom Kippur, Day of Atonement, when fate is sealed. Yikes! Anyway, I am going to ask for forgiveness for all the times I growled at other dogs, and those few times I got into tiffs with some. While I am not allowed to go to repent at the synagogue, I do get to do the yummy part... eating apples and honey to signify a sweet year to come. YUM! L'Shana Tovah - that is me barking a Happy New Year greeting in Hebrew! I had such a great birthday. I went to the beach and played ball in the ocean with new friends. 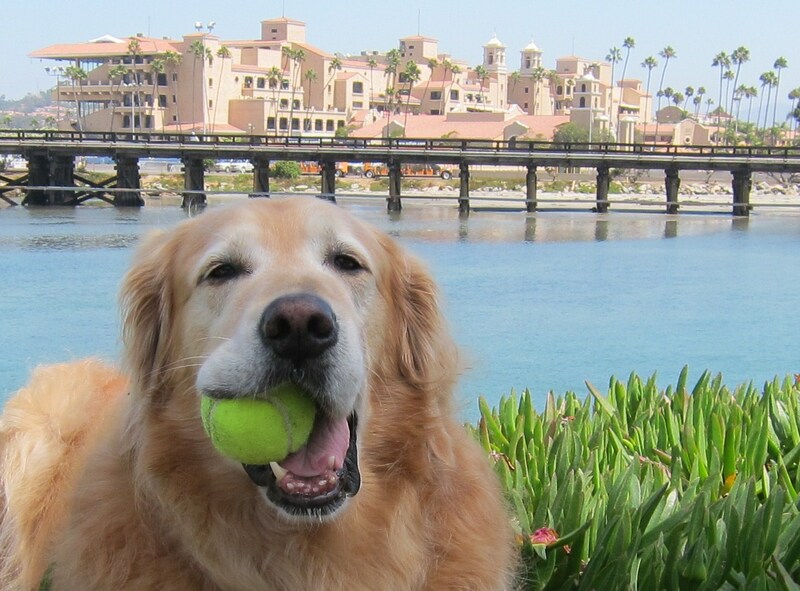 I got 3 bags of treats and 9 new tennis balls. And I got a big surprise. An ice cream and pizza birthday cake! Total Yum City! But my favorite present was going to visit Rosy at the hospital. That made me very happy. I hope it made her happy too! Today is my birthday and I am nine years old. That got me to thinking that I should "Dress to the Nines". I think the derby and bow tie accomplish the Nines dress code. But I am really hoping for beach time today, hence the sunglasses. Now I just need to take the sticker off the glasses so I won't look silly. My Mom took me birthday present shopping at my fave local pet store - Dexter's Deli. They gave me all sorts of samples to help me choose which treats I would like. Then we went over to the cake display and I couldn't help but drool. Well, I really like everything I picked out for my birthday. Can't wait until tomorrow! The Surf Dog Surf-A-Thon was so much fun yesterday. I loved the costume contest, especially since I wasn't in it. I thought the BeachBum Bull Dog was awesome. The surf dogs were really cool. Cograts to Buddy the Jack Russell who won again this year. My favorite part of the day was finally meeting Ricochet the surfing sensation (and top event fundraiser) ! She is so beautiful. I was a bit forward kissing her, but it was only on her ear. But I really shouldn't kiss and tell. Today is the 6th annual Surf Dog Surf-a-Thon. Its the largest surfing dog contest in the country. 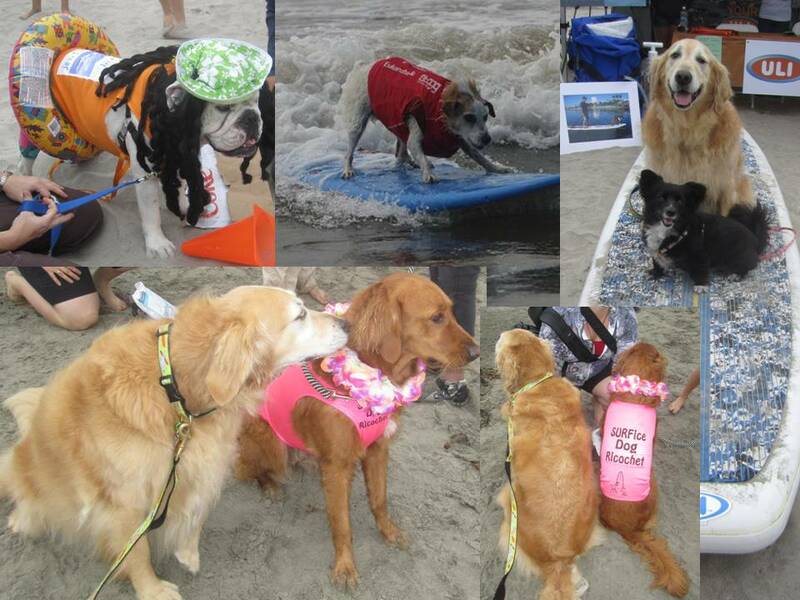 80 dogs hit the waves to raise awareness and money for orphaned pets at the Helen Woodward Animal Center. 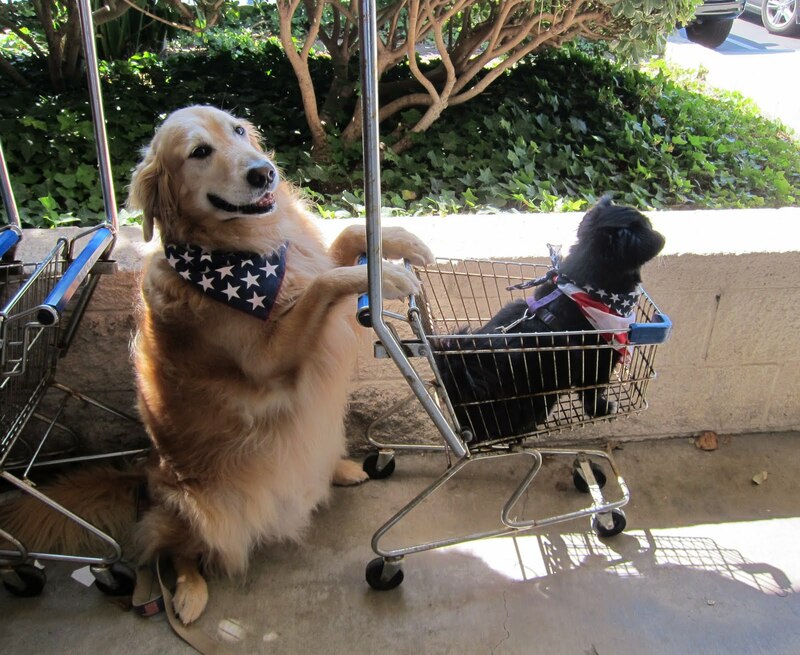 BunnyBell and I will be perusing and sampling at the vendor tents and unofficially judging the costume contests. While this year I will drool in awe of the surfers, I really hope next year I will get to be a surfer too. I do have a surf board ya know. 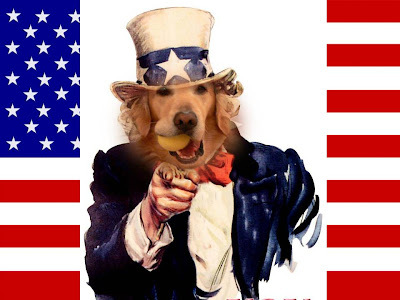 I understand that this is National Dog Week in the U.S. That got me to thinking. Why do we only have a week for dogs when the Chinese culture has a whole year of the dog. So I asked Mom and she told me that in our house we celebrate dogs everyday of our lives. Aww shucks Mom. I wish all humans felt like that. The other day while on my beach walk, I stopped to watch a game of beach volleyball. It looked pretty hard, but also a lot of fun. So I asked to borrow an extra ball to see if it would be a sport I would be interested in. 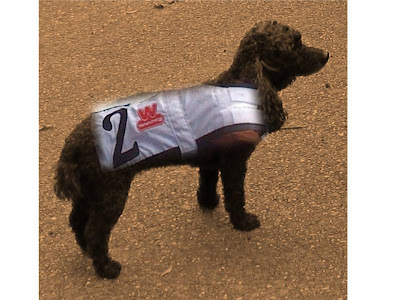 I decided that I do not have AirBud's talent. However, I could be very good at the spectator part. Yesterday we went to a local pet store to get more food for me. And then Mom got so excited so I looked up to see what she was looking at. It was the Halloween costume display. UhOh. Is it already that time of year again? I wonder what I will dress up as this year. I hope its not too embarassing. Today is the International Day of Peace dedicated to establishing and promoting world peace. I will participate in the One Minute of Silence for Peace observed at noon around the globe in all time zones. 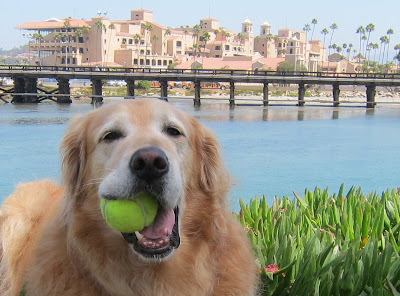 I will also be peaceful at the dog beach and not growl at any of the dogs, even if they try to take my ball. I wish I could do more for world peace. But I imagine if everyone did even a small peaceful thing we could make the world an even nicer place. Imagine. Before Rosy got sick, we went for a long walk on the beach. We came to one part and Mom said dogs are not allowed on that part of the beach. So Rosy and I went to see the sign ourselves. The picture clearly says No Golden Retrievers. But nowhere does it show no poodles or any other dogs for that matter. 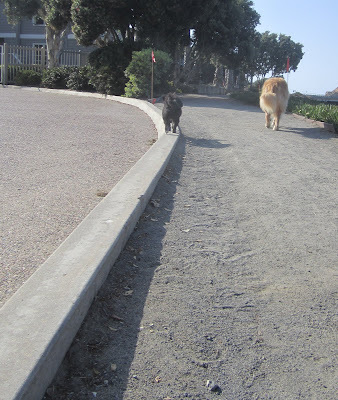 So Rosy wanted to continue to walk on that part of the beach. Mom had a hard time explaining to her why she couldn't, other than it wasn't fair to me. Very clear Golden discrimination, don't ya think? There have been all these construction trucks on one of the beaches and along the lagoon beach. They dig into the water, take a bunch of sand out and then take it to the other side of the beach. I thought it was cool that they were building giant sandcastles. 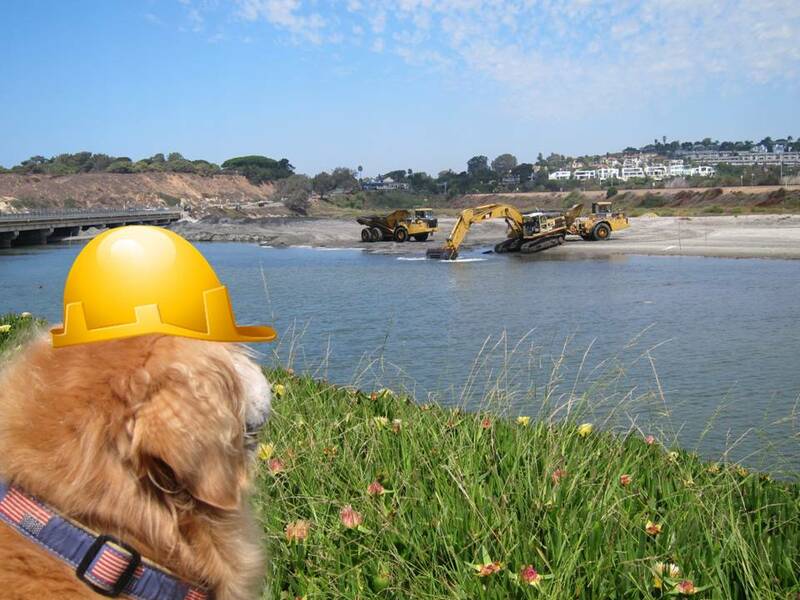 But Mom told me they are working to build up the beaches and add water flow to the wetlands area. So that got me to thinking. I am going to ask Mom to get me a hardhat to wear to the beach. Everytime Bunnybell takes a walk in this one area near where we live, she does the same thing. There is this curb and she makes it a point to walk on it twice during our walk. We are not sure why she does this. I think it is because she has dreams of being a tightrope walker. What do you think? On my roadtrip last month, I went to see the birthplace of Walmart in Bentonville, Arkansas. There it was, the first store - Walton's 5 and 10. This little store now serves as the Walmart visitor center. Then I went to see the Walmart Headquarters. It had this big sign in front saying how much money Walmart has saved families this year. About $230 billion! But if that was how much families saved, how much money does that mean they spent at Walmart? Wow. Walmart has really grown! 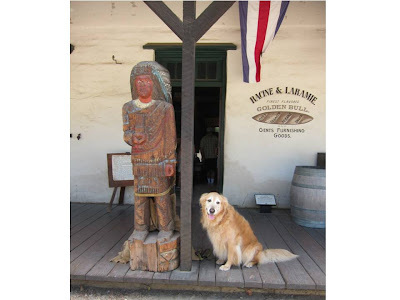 When we were in Old Town San Diego, I passed by a cigar store and there was a wooden Indian on the front porch. I asked Mom why it was there. She told me that in the old days these figures were used like advertising in front of tobacco stores. American Indians and tobacco were always associated because American Indians introduced tobacco to Europeans. 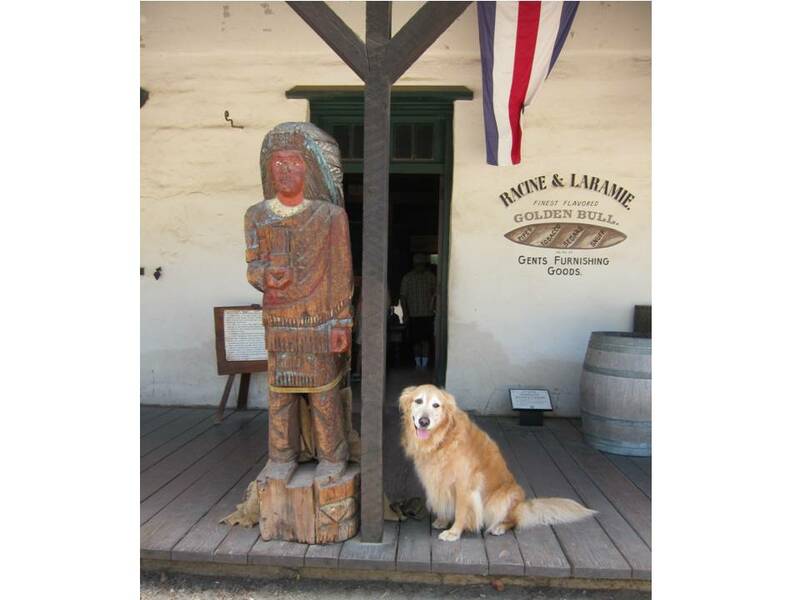 So the carved Cigar Store Indians started in Europe then arrived in the U.S. in the 18th century. Hmmm. I thought she was going to tell me that Jerry Seinfeld or Kramer brought it there. Mom just couldn't help herself. She saw a dog Spider costume and just had to buy it. She planned on it for Rosy. But since Rosy will be unavailable for dress up for a few months, BunnyBell was the perfect alternative. BunnyBell doesn't usually like costumes. But once she got this one on she became SpiderBunny. Not sure what special powers she thought she had, but SpiderBunny decided to attack the Bear. Scary! I had a dream last night that Scooby-Doo came to my beach for his birthday. Rosy and I had a party for him and even had waterproof hats. Of course we served Rooby Racks (Scooby snacks for those of you that don't speak Scooby). But then I woke up and said Ruh-Roh. Scooby's birthday was yesterday! I think he turned 7 again! Not sure though. ScoobyDoobyDoo-- how old are you? Rosy came home from the hospital! All her bandages are off and she has a really funny haircut. Her chest is shaved, I guess its a poodle trend. Anyway, the doctor said she's under "house arrest" for two weeks. She has to stay in the cage that we got her the other day. Even when she eats! She can only come out to get carried to go to the bathroom. But she seems to really like her new room (that is what she calls her cage). She asked Mom if she would buy her some home magazines for decorating ideas. On Saturday, Rosy had to have neck surgery due to a herniated disc. The surgery went well, but she needed to be hospitalized afterward. So to prepare for her homecoming today, we needed to go to Petco. Mom and Dad went to get the crate, so BunnyBell and I decided to look at other things. Afterward, Dad took us home while Mom went to visit with Rosy. She got to sit outside with her and give her chicken. I would have loved to go see her! BunnyBell would have loved to go share the chicken. Today is the 10th anniversary of 9/11. All around the nation, there are special tributes to honor the heroes of 9/11. 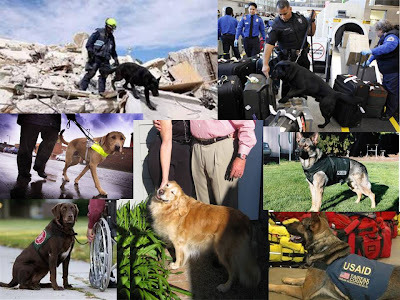 While all are equally important, I want to highlight the 9/11 Working Dog Recognition Ceremony being held today in New Jersey honoring over 1000 working dog teams who served in response to the terrorist attacks . 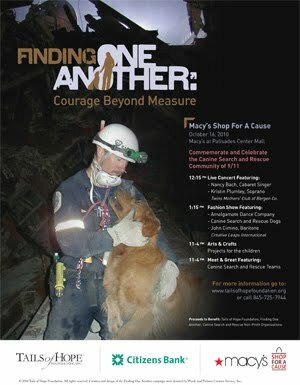 These teams were involved in search and rescue and security at Ground Zero, the Pentagon, Shanksville and the Fresh Kills landfill recovery site. They have never been fully honored. And while I cant be at the ceremony today, I want to personally thank, pay tribute and send BearHUGs to these heroic teams. As of Tuesday (after Labor day), I got my beach back! So Mom said we can go back to our old routine. I take a long walk (3 t0 6 miles) on leash with Mom and I can have off leash swim time before and after. But the other day I started walking real slow and looked at Mom with sad eyes and reminded her that I was soon going to be nine years old. So she felt bad and said from now on I didn't have to do the walks, and I can just do all swimming and playing off leash! I can't believe life got even better in San Diego! Please pinch me so I know I'm not dreaming. Ouch! Today is an important day in our household and it should be around the world. 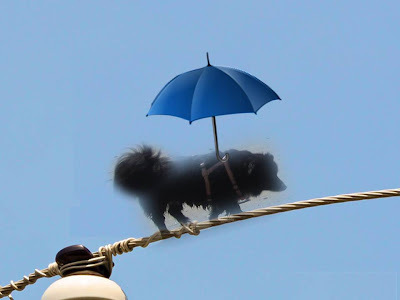 It is Black Dog Appreciation Day. It is trying to raise awareness of and dispel "Black Dog Syndrome" -- in shelters, Black dogs are usually the last to get adopted and most often killed. 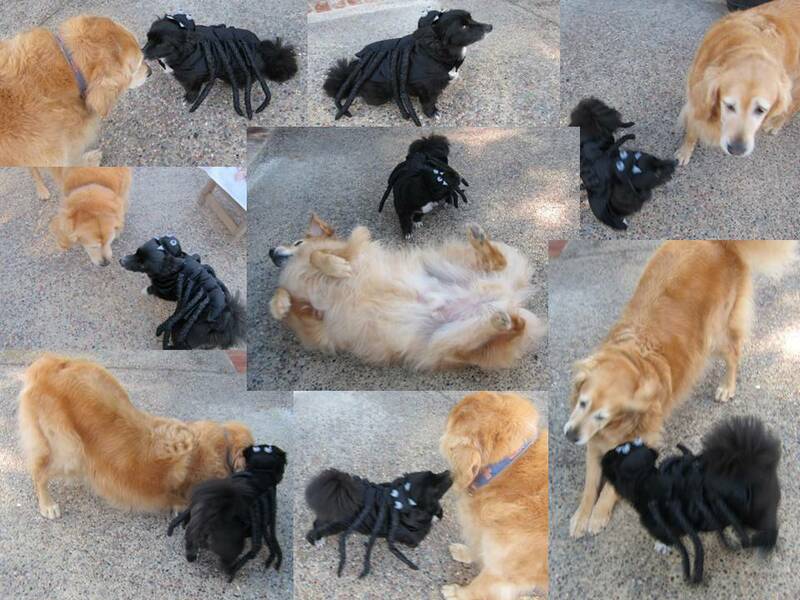 I really dont know why, we think Black dogs are pretty great. We have Rosy, a wonderful Black poodle, as you know we found abandoned on the street. And my niece BunnyBell, a fabulous Black Pomeranian Mix, rescued just in time by the Bill Foundation in Los Angeles. Our family not only appreciates our black dogs, but we consider ourselves lucky, cause we cant imagine our lives without them. I told you about my new Standard Poodle neighbors and showed you Sadie, Maxi-me to Rosy. Now I want to show you Hannah who I think is very beautiful. (Mom thinks I have a crush on her.) Hannah came back from the groomer the other day looking extra pretty and I wanted to compliment her. She had a feather in her hair! I told her I thought she looked like Stephen Tyler. And she ran away! What did I say? I just don't understand girls. Yesterday Mom and Dad and Sydne went to Del Mar Racetrack. 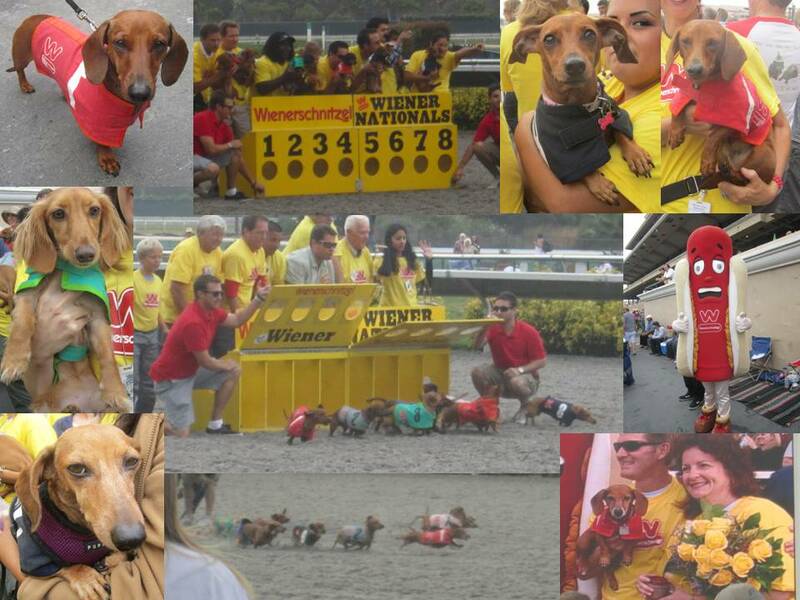 Dad heard there was going to be the Wienerschnitzel Wiener Nationals. He was excited cause he thought that would mean lots of hot dogs to eat. 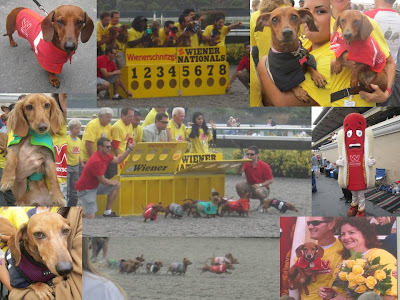 But instead, it was Dachsund Racing! Mom took pictures to show me since I wasnt allowed to go. The winner name was She's Motoring. She will compete in the National Finals. So it got me to thinking. Rosy is a really fast runner. Maybe we could give Rosy a haircut and spraypaint her brown. Do you think she could pass as a Dachsund? Today is Labor Day in the United States. It is a national tribute to the contributions workers have made to the strength and well-being of our country. Well that got me to thinking. Dogs are also workers like police dogs, guide dogs, therapy dogs and search-and-rescue dogs. And I work hard to protect my family and provide them with unconditional loyalty and love. So I think we should all celebrate with a pizza picnic. Yesterday we went Kayaking in San Diego Bay! SO COOL!First Dad got in the boat, then Mom with Rosy and then me. At first I was a bit scared and faced Dad. But his oar kept hitting my head, so I thought I should take their suggestion and turn around. Then I got to see everything and I was facing Mom so I was happy. I really like boating. I hope I can do it more often. I know. I will start saving money to buy Mom and Dad a boat for their anniversary in June. The other day when I was taking my walk, I looked over and saw a Golden looking at me. Then I turned away to sniff something and when I looked up. I thought I was seeing double! Now there were two! I was about to go over to say hello but they ran inside. I think their Mom was calling. Isn't it cool that I have all these new neighbors? I cant wait to meet them!